If you fancy having a go take a peek at the instructions below. Its soooo easy and I think it would make a neat little gift. ♥ A printer to print out this pdf. The pdf is a single page which contains all three designs pictured. 1) Simply print pdf and cut out. 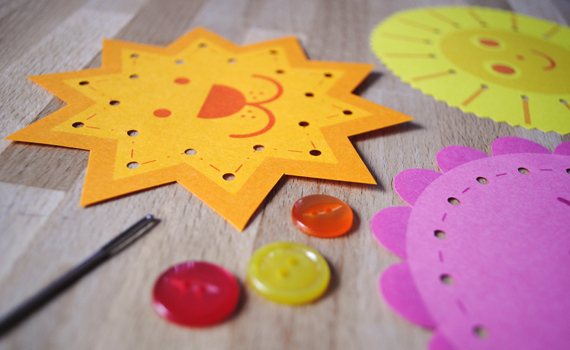 I use pinking shears to cut out the ‘sun’ lacing card out but regular scissors are just fine! 2) Punch holes out (as pictured). 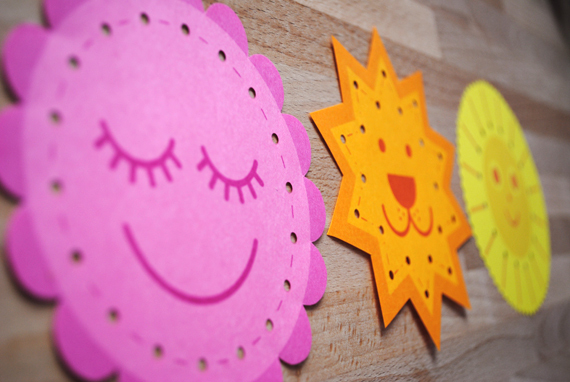 I used a 1/8″ circle craft punch but a regular holepunch will work just fine. 3) Give your child a length of wool and a blunt needle and watch them go! If you don’t have a blunt needle to hand you could also use a pipe cleaner bent into the shape of a needle. If you have neither then you can simply wrap sellotape around the end of some wool. 4) I tied a button onto the end of the wool to act as a stopper. If you have any problems leave a comment below and I’ll do my best to help. WARNING: I would recommend you closely supervise your little one – even with a blunt needle.